There was a run-down restaurant near my flat in China. I only used to go there because it was so close. It was always full of workers, mainly men and all of them over 40. The menu was uninspiring, the cleanliness standards were worrying, and the staff uninteresting. But it was cheap, extremely cheap. And the cheapest thing on the menu was their tomato soup, 3.5元 for a bowl. Add some rice, and you have the most inexpensive meal in town! 柿子鸡蛋汤(shizi-jidan-tang) or Tomato and Egg Soup is a brilliant food for anyone on a time and money budget. This makes enough for at least two people. 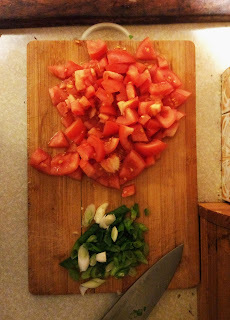 Chop the tomatoes into smallish pieces(it doesn't need to be beautiful or scientific, see picture). Break the egg(s) into a bowl and mix the yolk and white. NOT VIGOROUSLY. Slice the spring onions (see picture). 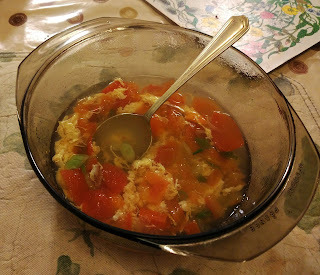 Bring the stock/water+chicken powder to the boil and then throw in the tomato pieces. 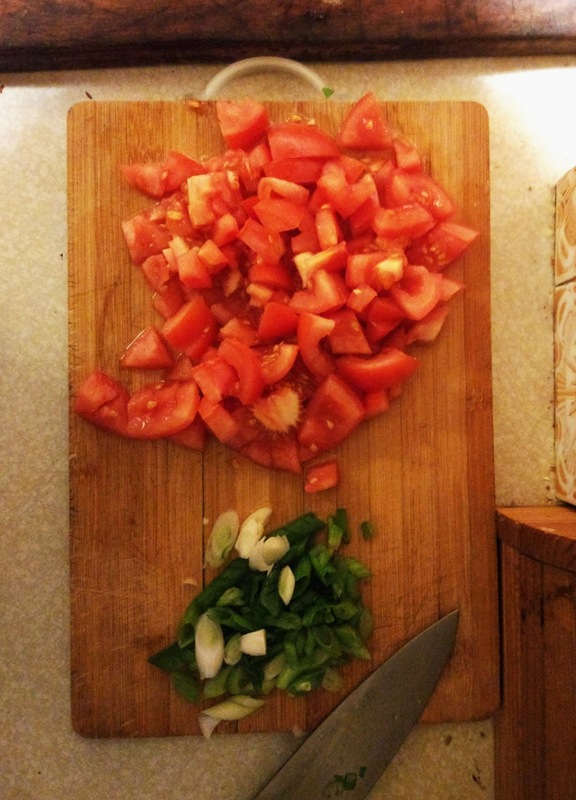 Let them boil for minimum 10 minutes to soften and dissolve the tomato pieces. There should still be chunks floating around. After 10 mins or so, pour the eggs in and stir a few times with a chopstick. Put the sliced spring onion in and add some soy sauce to flavour, mix and then cover for 1-2 minutes. DONE. This soup is full of nutrition, insanely filling and just about as cheap as you can get. It looks great and if you want to impress someone, just add some chopped coriander before you eat and serve it in a glass bowl for maximum effect!